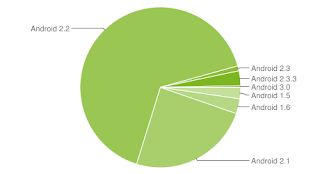 According to the latest Android platform figures from Google, Android 2.2 ‘FroYo’ is now on over 65% of the total Android devices, while Android 2.1 aka Éclair is still present on 25% of the phones. Gingerbread is limited to just 4% of the total market because the delay by device vendors in pushing the updates. First Gingerbread devices have just start reaching market from the likes of HTC, while Samsung is still waiting for release a Gingerbread phone apart from Nexus S.
Motorola is totally absent from the scene, no Gingerbread device till now, and its track record with updates is worse than none. Sony Ericsson is the only vendor with two Android 2.3 devices in the market, and third is waiting to be launched, but the Earthquake in Japan has created some supply issues. Coming to Honeycomb, its platform share hasn’t crossed even 1% and is just 0.3%. We are hoping that the recent tablet launches by Acer and Asus will help improve this figure. Samsung is again waiting for production of their Honeycomb tablets.